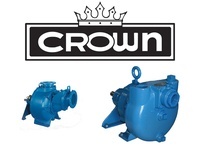 Crown, a Crane Pumps brand, is designed for wastewater and construction dewatering. The most popular series are the B Self Priming Series and the Solids handling Self Priming Pump Series. Crown pumps prides itself upon saving customers hard earned dollars through maximizing pump efficiency operations and with lower capital costs plus the ease of serviceability. Crown pumps offers unexcelled pumping performance to 4,400 Gallons Per Minutes (GPM) (1000 m3/h) and a Head to Feet of 184 feet. (56m) while handling solids up to 3 inches in diameter. These self priming pumps are Available in both close coupled & frame mounted direct or V Belt drive configurations.